A chest radiograph may be helpful in providing support for the diagnosis of systemic sarcoidosis, with 90% of chest radiographs revealing hilar lymphadenopathy, lung parenchyma involvement, or both. However, patients may have completely normal images despite neurologic symptoms. Lymphoma may also demonstrate hilar lymphadenopathy on chest radiography. Multiple myeloma, hemangiomas, metastatic disease, and various lytic benign bone lesions also produce lytic calvarial lesions with nonsclerotic borders. A skull radiograph may incidentally demonstrate osteolytic calvarial lesions, although such a radiograph is not done routinely. Axial basal meninges and coronal basal meninges: Axial and coronal T1-weighted postcontrast MRI image demonstrates nodular, enhancing leptomeningeal lesions, particularly involving the basal cisterns and leptomeninges. Axial CT scan of the cerebrum: Noncontrast axial CT scan of the head demonstrates an area of low density in the right frontal lobe white matter and demonstrates a more anterior area of high density in the anterior interhemispheric fissure. 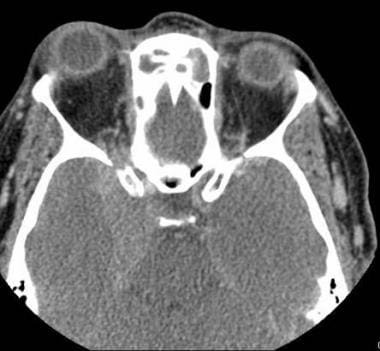 Gallium scan "panda" sign: A gallium scan demonstrates the "panda" sign of increased radiotracer uptake in the lacrimal, parotid, and salivary glands bilaterally. There was also increased uptake in the right frontal region, which corresponded with an intracranial mass lesion seen on MRI. 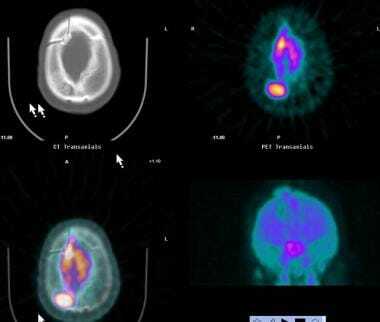 Positron emission tomography: PET images demonstrate an area of increased uptake in the right parietal region and temporal lobe, consistent with enhancing granulomas seen on MRI. Neurosarcoidosis may involve any portion of the central nervous system, including the brain, meninges, intracranial blood vessels, and spinal cord. Noncaseating granulomas of sarcoidosis are found in the adventitia of small and medium-size blood vessels, usually sparing the intima and media. However, mass compression of granulomas may cause the vessel lumen to become narrowed or obstructed, thereby resulting in infarction. Cranial nerves, including the optic nerve, can be affected by direct granuloma compression or by infiltration of the meninges or the nerve itself. The cervical and thoracic regions are the most common sites of spinal involvement. Symptoms of neurosarcoidosis depend on the location of involvement and the size of the granuloma. Cranial nerve palsy has been reported to occur in 73% of patients; aseptic meningitis, in 18%; focal cerebral parenchymal disease, in 15%; and hydrocephalus, in 6%. The facial nerve (CN VII) is the most common site affected, and 75% of cases are bilateral. Facial nerve palsies often occur rapidly and then resolve spontaneously. When facial nerve palsy is associated with parotiditis, anterior uveitis, and fever, it is termed Heerfordt syndrome. The optic nerve is the second most commonly involved cranial nerve. The clinical symptoms include visual-field deficits, blurry vision, optic neovascularization, and papillary edema. Patients with involvement of CN VIII may present with vertigo and hearing loss,  while patients with involvement of the glossopharyngeal and vagus nerves can present with dysphagia and dysphonia. 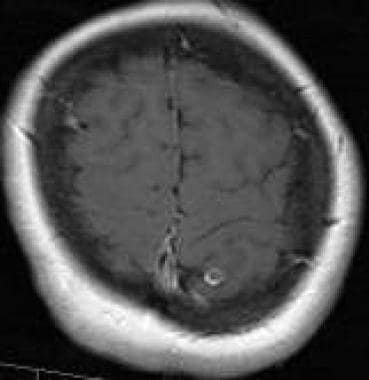 The hallmark of neurosarcoidosis on computed tomography (CT) and magnetic resonance imaging (MRI) is basal leptomeningeal involvement. Leptomeningeal involvement and granulomatous infiltration of the subependyma are the 2 primary causes of hydrocephalus resulting in intrinsic obstruction. [31, 32] Clinically, neurosarcoidosis may present as meningitis. There is no definitive lab test to make the diagnosis; however, CSF examination may be helpful. The spinal fluid examination reveals mild to moderate pleocytosis, especially lymphocytic, and the protein level is usually elevated. There is an elevated angiotensin converting enzyme (ACE) level in 50% of patients. Patients with parenchymal involvement most commonly present with encephalopathy, including seizures, mood disturbances, cognitive impairment, psychosis, and personality changes. Other symptoms include headache, fatigue, seizures, multiple sclerosis–type symptoms, amnesia, intractable hiccoughs, schizophreniform symptoms, and acute stroke. Granulomatous involvement of the hypothalamus may result in diabetes insipidus, hypersomnolence, and impaired thermoregulatory mechanism. Involvement of the intracranial vascular structures resembles the involvement in other vasculitides, presenting as subarachnoid hemorrhage, stroke, dementia, psychosis, and epileptic seizures. There is spinal involvement in less than 1% of cases; such involvement may include cauda equina syndrome, back pain, and polyradiculopathies. Axial MRI of the cerebrum: Contrast-enhanced axial MRI image of the head, at the same level as the CT scan in the previous image, demonstrates an area of high density corresponding to a nodular, enhancing area of thickening of the leptomeninges. Osteolysis CT: Axial CT at the base of the skull with a bone window setting demonstrates osteolysis of the ethmoid sinus walls bilaterally in a patient with neurosarcoidosis and sinonasal involvement. Other findings include enhancing parenchymal masses with adjacent white-matter edema, optic nerve and chiasma enlargement and enhancement, and enlargement of the parotid, salivary, and lacrimal glands. CT is neither specific nor sensitive; only 25-63% of patients with neurosarcoidosis have abnormal CT findings. 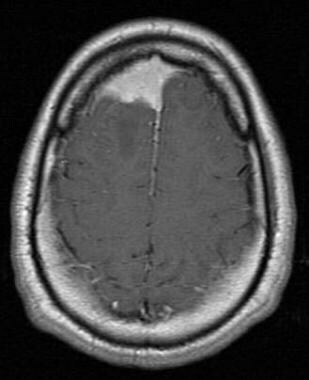 Meningioma, leptomeningeal carcinomatosis, metastatic disease, and primary neoplasms can all present similar CT findings. In 40% of cases of neurosarcoidosis, there are isointense T1-weighted and T2-weighted leptomeningeal nodules or plaques with focal or diffuse leptomeningeal thickening. [33, 34] The areas homogeneously enhance on postgadolinium T1-weighted sequences. The findings are most often seen at the base of the brain. Leptomeningeal disease can also appear as a dural-based mass with homogeneous enhancement, with T1-weighted and T2-weighted signal characteristics mimicking a meningioma. Solitary or multifocal ringlike, enhancing white-matter lesions are the second most common cerebral parenchymal finding. Ring-enhancing mass: Axial T1-weighted postcontrast MRI image shows a ring-enhancing mass in the left parietal lobe, mimicking a neoplasm. The lesions are isointense on T1-weighted images and are usually hypointense on T2-weighted images, which is thought to be related to fibrocollagenous build-up. These lesions enhance homogeneously with contrast and are often associated with adjacent leptomeningeal lesions; therefore, they are believed to be secondary to leptomeningeal spread along perivascular spaces, presenting at a later disease stage and correlating with a poor prognosis. After treatment, the lesions decrease in signal intensity and do not enhance with contrast. On T1-weighted and T2-weighted images, involvement of the hypothalamus or the pituitary stalk may present as a hypointense to isointense thickening, with nodular or heterogeneous enhancement. Uveitis is the most common form of ocular involvement, occurring in 80% of patients. The process is usually bilateral, as is lacrimal gland involvement. There is parotid gland involvement in 6% of patients, often associated with widespread systemic disease. Optic nerve or optic chiasm enhancement, or both, is present in 70% of patients (see the images below); an increased FLAIR signal without morphologic change is the predominant finding in optic nerve sarcoidosis. There is often contiguous involvement from the optic chiasm to the intracranial optic nerve, or there is nodular noncontiguous involvement of the contralateral optic nerve, which is considered to be a “stem-to-stem” appearance. 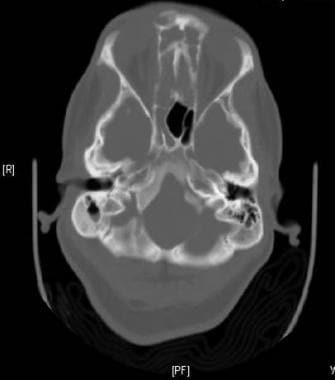 Neurosarcoidosis can also involve the retrobulbar fat, extraocular muscles, and globe in a diffuse, enhancing, infiltrative pattern that is indistinguishable from orbital pseudotumor. CT orbital fissure and MRI orbital fissures: Axial T-weighted and T1-weighted postcontrast MRI images demonstrate an enhancing mass involving the right temporal lobe, basal meninges, right cavernous sinus, and sellar region. The lesion also extends into the right retrobulbar fat. Cranial nerve involvement may present as isointense on T1-weighted images and as enlargement of the cranial nerves on T2-weighted images, with enhancement on postcontrast T1-weighted images. Involvement of CN VIII (10-20% of cases) is often seen as a retrocochlear mass or an enlarged internal auditory canal, which is bilateral in 75% of cases. Nerve involvement is thought to occur because of perivascular and intraneural lymphocytic infiltration. 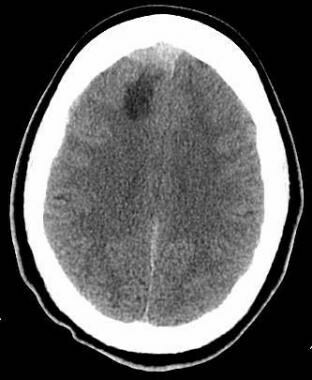 Hydrocephalus occurs in 5-12% of patients and may be communicating or obstructive. The affected area of the spinal cord is enlarged. The first phase involves leptomeningeal enhancement, followed by leptomeningeal spread, resulting in patchy, peripherally located lesions in the spinal cord. The lesions are isointense on T1-weighted images and hypointense on T2-weighted images. These lesions then coalesce and consolidate. There may be chronic ischemia and direct disruption of neural pathways, resulting in spinal cord atrophy (see the image below). 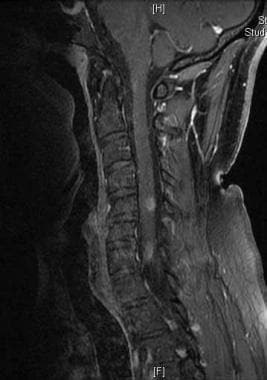 Spinal MRI: Sagittal STIR (short T1 inversion recovery) image of the cervical spine demonstrates 2 areas of increased linear peripheral signal in the spinal cord in a patient with neurosarcoidosis. Intradural extramedullary findings include pial enhancement; isointense enhancing root nodules; clumping of nerve roots; and isointense (possibly hypointense on T2-weighted images) enhancing cauda equina masses. Extradural findings may involve paraspinal masses, spondylodiskitis, and enlarged cervical nerve roots on myelography. Osteolytic, well-circumscribed lesions, with nonsclerotic margins, are present. Bone scans may show increased radiotracer uptake. MRI findings of bacterial, viral, fungal, lymphomatous, plasmacytoma, or carcinomatous meningitis may appear similar to those of leptomeningeal sarcoidosis. The discrete intraparenchymal lesions of sarcoidosis may mimic the findings of astrocytoma, meningioma, tumefactive demyelination, and metastatic disease. Findings of optic neuritis, multiple sclerosis, syphilis, cryptococcosis, and radiation-induced optic neuritis can look identical to findings of optic sarcoidosis. MRI findings of histiocytosis and tuberculosis are similar to the MRI findings of pituitary sarcoidosis. Single-photon emission computed tomography (SPECT) may show asymmetric hyperfixation of technetium-99m (99mTc) hexamethylpropyleneamine oxime (HMPAO) in areas affected acutely, possibly representing hyperperfusion of these areas secondary to active inflammation. Whole-body PET imaging for sarcoidosis is up to 97% sensitive for pulmonary and lymphatic findings. Gallium uptake in sarcoidosis is similar to that in Sjogren disease, rheumatoid arthritis, and cytomegalovirus infection. Pulmonary PET findings for sarcoidosis cannot be distinguished from those for lymphoma. Athyal, Singh. Sellar and Parasellar Neurosarcoidosis. Indian Journal of Radiology and Imaging. 2002. 12(4):487-489. Colvin IB. Audiovestibular manifestations of sarcoidosis: a review of the literature. Laryngoscope. 2006 Jan. 116(1):75-82. [Medline]. Duhon BS, Shah L, Schmidt MH. Isolated intramedullary neurosarcoidosis of the thoracic spine: case report and review of the literature. Eur Spine J. 2011 May 20. [Medline]. Hamasaki T, Noda M, Kamei N, Yamamoto S, Ochi M, Yasunaga Y. Intradural extramedullary mass formation in spinal cord sarcoidosis: case report and literature review. Spine. 2003 Oct 15. 28(20):E420-3. [Medline]. Hesselmann V, Wedekind C, Terstegge K, Schulte O, Voges J, Krug B, et al. An isolated fourth ventricle in neurosarcoidosis: MRI findings. Eur Radiol. 2002 Dec. 12 Suppl 3:S1-3. [Medline]. Hughes et al. Neurosarcoidosis. Contemporary Neurosurgery. Feb. 15, 2007. 29(3):8. Nardone R, Venturi A, Buffone E, Lochner P, Marth R, Florio I, et al. Extramedullary spinal neurosarcoidosis: report of two cases. Eur Neurol. 2005. 54(4):220-4. [Medline]. Nische et al. Disseminated intraparenchymal microgranulomas in the brainstem in central nervous system sarcoidosis. Neuropathology. 2005. 25:361-364. Palacios E, Rigby PL, Smith DL. Cranial neuropathy in neurosarcoidosis. Ear Nose Throat J. 2003 Apr. 82(4):251-2. [Medline]. Sakushima K, Yabe I, Nakano F, Yoshida K, Tajima Y, Houzen H, et al. Clinical features of spinal cord sarcoidosis: analysis of 17 neurosarcoidosis patients. J Neurol. 2011 May 7. [Medline]. Sollima S, Croce F, Scalamogna C, Caramma I, Antinori S. Sarcoidosis presenting with massive involvement of the nervous system. Ann Intern Med. 2005 Mar 15. 142(6):475-6. [Medline]. Spencer TS, Campellone JV, Maldonado I, Huang N, Usmani Q, Reginato AJ. Clinical and magnetic resonance imaging manifestations of neurosarcoidosis. Semin Arthritis Rheum. 2005 Feb. 34(4):649-61. [Medline]. Stern BJ. Neurological complications of sarcoidosis. Curr Opin Neurol. 2004 Jun. 17(3):311-6. [Medline]. Terushkin V, Stern BJ, Judson MA, Hagiwara M, Pramanik B, Sanchez M, et al. Neurosarcoidosis: presentations and management. Neurologist. 2010 Jan. 16(1):2-15. [Medline]. Ungprasert P, Matteson EL. Neurosarcoidosis. Rheum Dis Clin North Am. 2017 Nov. 43 (4):593-606. [Medline]. Tavee JO, Stern BJ. Neurosarcoidosis. Clin Chest Med. 2015 Dec. 36 (4):643-56. [Medline]. Gozubatik-Celik G, Uygunoglu U, Uluduz D, et al. Diagnosis and Treatment in Neurosarcoidosis. Noro Psikiyatr Ars. 2015 Mar. 52 (1):102-106. [Medline]. Gerke AK. Morbidity and mortality in sarcoidosis. Curr Opin Pulm Med. 2014 Sep. 20 (5):472-8. [Medline]. Hoitsma E, Drent M, Sharma OP. A pragmatic approach to diagnosing and treating neurosarcoidosis in the 21st century. Curr Opin Pulm Med. 2010 Sep. 16(5):472-9. [Medline]. Jennings JW, Rojiani AM, Brem SS, Murtagh FR. 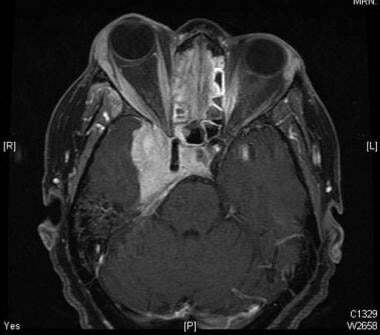 Necrotizing neurosarcoidosis masquerading as a left optic nerve meningioma: case report. AJNR Am J Neuroradiol. 2002 Apr. 23(4):660-2. [Medline]. Kellinghaus C, Schilling M, Lüdemann P. Neurosarcoidosis: clinical experience and diagnostic pitfalls. Eur Neurol. 2004. 51(2):84-8. [Medline]. Kumar N, Frohman EM. Spinal neurosarcoidosis mimicking an idiopathic inflammatory demyelinating syndrome. Arch Neurol. 2004 Apr. 61(4):586-9. [Medline]. Vahid B, Weibel S. Glioblastoma multiforme disguised as sarcoidosis: pitfalls in diagnosis. South Med J. 2007 Mar. 100(3):335. [Medline]. Wiesli P, Hess K, Cathomas G, Stey C. Neurosarcoidosis presenting as cerebellar mass. Eur Neurol. 2000. 43(1):58-9. [Medline]. Koyama T, Ueda H, Togashi K, Umeoka S, Kataoka M, Nagai S. Radiologic manifestations of sarcoidosis in various organs. Radiographics. 2004 Jan-Feb. 24(1):87-104. [Medline]. Menninger MD, Amdur RJ, Marcus RB Jr. Role of radiotherapy in the treatment of neurosarcoidosis. Am J Clin Oncol. 2003 Aug. 26(4):e115-8. [Medline]. Pickuth D, Spielmann RP, Heywang-Köbrunner SH. Role of radiology in the diagnosis of neurosarcoidosis. Eur Radiol. 2000. 10(6):941-4. [Medline]. Vannemreddy PS, Nanda A, Reddy PK, Gonzalez E. Primary cerebral sarcoid granuloma: the importance of definitive diagnosis in the high-risk patient population. Clin Neurol Neurosurg. 2002 Sep. 104(4):289-92. [Medline]. El Mouedden J, Duray MC, Hernalsteen D, Cosnard G. Extensive neurosarcoidosis and optic nerve complications. JBR-BTR. 2011 Mar-Apr. 94(2):66-7. [Medline]. Imran TF, Nizami S, Eyzner I, Mirani N, Hossain T, Fede R, et al. Vertigo as a predominant manifestation of neurosarcoidosis. Case Rep Med. 2015. 2015:397046. [Medline]. Akhondi H, Barochia S, Holmström B, Williams MJ. Hydrocephalus as a presenting manifestation of neurosarcoidosis. South Med J. 2003 Apr. 96(4):403-6. [Medline]. Castellano-Sanchez AA. Extensive leptomeningeal and intraparenchymatous spinal cord neurosarcoidosis. South Med J. 2000 Aug. 93(8):815-7. [Medline]. Christoforidis GA, Spickler EM, Recio MV, Mehta BM. MR of CNS sarcoidosis: correlation of imaging features to clinical symptoms and response to treatment. AJNR Am J Neuroradiol. 1999 Apr. 20(4):655-69. [Medline]. Wengert O, Rothenfusser-Korber E, Vollrath B, Bohner G, Scheibe F, Otto C, et al. Neurosarcoidosis: Correlation of cerebrospinal fluid findings with diffuse leptomeningeal gadolinium enhancement on MRI and clinical disease activity. J Neurol Sci. 2013 Sep 11. [Medline]. Hayes WS, Sherman JL, Stern BJ, Citrin CM, Pulaski PD. MR and CT evaluation of intracranial sarcoidosis. AJR Am J Roentgenol. 1987 Nov. 149(5):1043-9. [Medline]. Wegener S, Linnebank M, Martin R, Valavanis A, Weller M. Clinically isolated neurosarcoidosis: a recommended diagnostic path. Eur Neurol. 2015. 73(1-2):71-7. [Medline]. 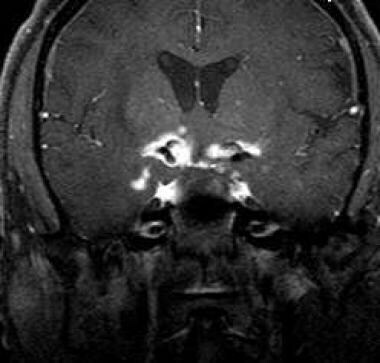 Arias M, Iglesias A, Vila O, Brasa J, Conde C. MR imaging findings of neurosarcoidosis of the gasserian ganglion: an unusual presentation. Eur Radiol. 2002 Nov. 12(11):2723-5. [Medline]. Bode MK, Tikkakoski T, Tuisku S, Kronqvist E, Tuominen H. Isolated neurosarcoidosis - MR findings and pathologic correlation. Acta Radiol. 2001 Nov. 42(6):563-7. [Medline]. Dumas JL, Valeyre D, Chapelon-Abric C, Belin C, Piette JC, Tandjaoui-Lambiotte H, et al. Central nervous system sarcoidosis: follow-up at MR imaging during steroid therapy. Radiology. 2000 Feb. 214(2):411-20. [Medline]. Fels C, Riegel A, Javaheripour-Otto K, Obenauer S. Neurosarcoidosis: findings in MRI. Clin Imaging. 2004 May-Jun. 28(3):166-9. [Medline]. Shah R, Roberson GH, Curé JK. Correlation of MR imaging findings and clinical manifestations in neurosarcoidosis. AJNR Am J Neuroradiol. 2009 May. 30(5):953-61. [Medline]. Piekarski E, Benali K, Rouzet F. Nuclear Imaging in Sarcoidosis. Semin Nucl Med. 2018 May. 48 (3):246-260. [Medline]. Aide N, Benayoun M, Kerrou K, Khalil A, Cadranel J, Talbot JN. Impact of [18F]-fluorodeoxyglucose ([18F]-FDG) imaging in sarcoidosis: unsuspected neurosarcoidosis discovered by [18F]-FDG PET and early metabolic response to corticosteroid therapy. Br J Radiol. 2007 Mar. 80(951):e67-71. [Medline]. 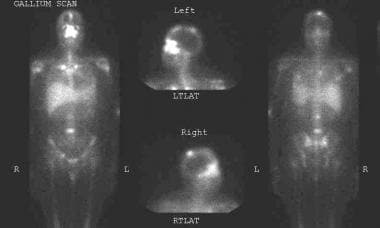 Dubey N, Miletich RS, Wasay M, Mechtler LL, Bakshi R. Role of fluorodeoxyglucose positron emission tomography in the diagnosis of neurosarcoidosis. J Neurol Sci. 2002 Dec 15. 205(1):77-81. [Medline]. Ng D, Jacobs M, Mantil J. Combined C-11 methionine and F-18 FDG PET imaging in a case of neurosarcoidosis. Clin Nucl Med. 2006 Jul. 31(7):373-5. [Medline]. Meenakshi M, Arnold C, Broadley SA. The value of [18F]-fluorodeoxyglucose-positron emission tomography/CT scanning in the diagnosis of neurosarcoidosis. J Clin Neurosci. 2012 Oct. 19(10):1461-2. [Medline]. Hodge MH, Williams RL, Fukui MB. Neurosarcoidosis presenting as acute infarction on diffusion-weighted MR imaging: summary of radiologic findings. AJNR Am J Neuroradiol. 2007 Jan. 28(1):84-6. [Medline]. Kanaly CW, Selznick LA, Cummings TJ, Adamson DC. Cerebellar cryptococcoma in a patient with undiagnosed sarcoidosis: case report. Neurosurgery. 2007 Mar. 60(3):E571; discussion E571. [Medline]. Kent, et al. Neurosarcoidosis presenting with lower-back and legpain. American Journal of Physical Medicine and Rehabilitation. Jan 2007. 86(1):1-2. Mahadewa TG, Nakagawa H, Watabe T, Inoue T. Intramedullary neurosarcoidosis in the medulla oblongata: a case report. Surg Neurol. 2004 Mar. 61(3):283-7; discussion 287. [Medline]. Coronalchiasm and axialchiasm: Coronal and axial T1-weighted postcontrast images demonstrate enhancement of the optic chiasm. Coronal chiasm and axial chiasm: Coronal and axial T1-weighted postcontrast images demonstrate enhancement of the optic chiasm. 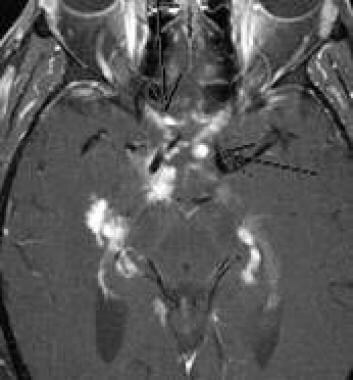 Cerebellopontine-angle mass: Axial T1-weighted postcontrast MRI image demonstrates bilateral enhancing cerebellopontine angle masses in a patient with neurosarcoidosis.